The Brooklyn-raised actress, whose credits include small parts in “Law & Order: Criminal Intent” and “Half Nelson,” came on to the project in its first incarnation as a short film. Shortly after it was completed, the Sundance Institute invited Rees to workshop a feature based on the material. 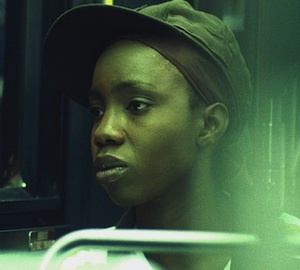 Once the new incarnation was greenlit, Oduye was asked back to revisit the role. Basking in the glow of a festival high, an all-smiling Oduye spoke with indieWIRE after the “Pariah” world premiere. Among the topics covered: How she nabbed the role, what she has planned next and why she landed into acting. Below are snippets from the talk. To watch the full conversation, view the video below. How has the Sundance ride been so far for you? I just keep saying thank you. People come up to me and make it a point to express what the film meant to them. I keep questioning why I’m overwhelmed. I just didn’t have any expectations I guess. I shot the film and it was done. I guess I wasn’t thinking too far ahead, taking it step by step. It just reminds me of the power of film and why I chose this path of acting. If there’s one word to describe everything, it’s surreal. Given how meaty your role in “Pariah” is and the love you’re feeling at Sundance, are you at all apprehensive that no experience will top this? I get a little nervous. My intention is to do this kind of work, especially film work. I know the business, I know the variety of stuff out there. So I just have to shut off my brain and just put out there what kind of work I want to do. I just hope I get to continue to do this kind of work that continually inspires and is far reaching. I’ve been really lucky to meet people and do projects in theater and film that are in this same vein. Has film always been your niche, or did you grow up as a theater brat? When I first wanted to be an actor, I was all about film. My favorite film was “The Apostle.” That was the film that made me realize what kind of work I want to do. So I started out focusing on film and did a bunch of short and grad thesis films. Theater was maybe a little scarier; I didn’t know if there was a place for me. The first play I really at Hartford Stage and last year I was able to do a play at the Yale Repertory Theater. Film is still the focus, because I feel it’s a wide-reaching medium. I love that you can watch a film and 10 years later still be affected. How did you become involved with the initial short and where were you when you learned the feature was green lit? I literally just saw a breakdown for it. It was a grad thesis project for the director. I didn’t originally submit for the lead. I don’t know what it was; I was thinking small. I went into the audition with my little brother’s clothes — baggy pants and baggy shirt. I came in and I remember having a really fun audition. I got a callback and another callback and then I got offered the role. Dee Rees’ “Pariah.” Photo courtesy of Sundance Film Festival. How did shooting the feature compare to the short? It was longer, which I loved. I love being on set. I didn’t actually think it’d be tiring. I was ready for it. There were days when I’d come home and I’d be so tired, but getting up and going back to do it again was like the best thing ever. The shoot was 18 days, so I had to learn how to be really flexible really fast. I had to shift really quickly and not get frustrated with myself. I didn’t necessarily need time to marinate in a scene or a situation. It was great to just interact with the actors. It was really a life-changing experience. There was a moment on set where I was waiting for them to finish a setup and I had a moment in my heart where I was like, ‘Wow, this is what I born to do.’ It was so clear and quiet. Was your family at all concerned about the content of the script, this being your debut feature role? The reason why I found acting is because my father passed away. He passed away really young. I was going to go to med school. My father’s dream was that all of his kids become doctors. I realized in school I didn’t like it. When he died, it was like a wake-up call. Life is too short to do something you don’t want to do. So I took acting classes in my senior year and I loved it. I was like, ‘I’m going to be an actor,’ though I had no idea what that really meant. When I graduated, my mom was like, ‘So what’s up with med school?’ She really thought I went crazy. I also think too, she was really worried. When you go to med school, it’s like a straight shot. She’s not from this country. She doesn’t really know what it means to be an actor. She did know it was going to be very challenging. In the beginning, she just wished I went back to school for anything. Right now, she’s very supportive. Actually, when she saw the film for the first time, I didn’t tell her what it was about. I didn’t even think to tell her. My mother’s a pretty warm, open person. I knew she wasn’t going to be praying over me or anything like that. When I told her we were going back to Sundance, she was like, ‘Again?’ She sees that this makes me happy. What’s the game plan for after Sundance? Going back to New York. My intention is to do more films in this vein. As long as it’s good writing and good work, we’ll see.